Peter Nelson, manager of the Winding Road Racing So Cal store, is an avid HPDE driver. He recently had the chance to test the Apex Pro Digital Driving Coach on a track day. Because the Apex Pro operates differently from most data systems, he thought this review of the Apex Pro track coach would be helpful to drivers thinking about which data system to buy. The thing about driving through Southern California highway construction in a small, stiff Japanese hatchback, is that its contents shift around frequently. The car has to roll through large bumps left by lumbering 18-wheelers and awkwardly re-aligned lanes with significant chasms between the road surfaces. All this movement had me primarily nervous about one thing: my newly picked up Apex Pro Digital Driving Coach sitting in my gear bag. I was on my way up to Buttonwillow Raceway Park on a sweltering early Saturday evening for a full day of track time on Sunday with Speed Ventures. I decided to be smart about the trip, for once, by coming in the night before to hang out with friends and get a good night’s sleep instead of my normal 4:00 AM departure time from Long Beach. Hotels just south of the track are unbelievably cheap if you’re okay with blaring highway noise and an air conditioner that produces a sound, not unlike that of a hydroelectric dam’s generators. I knew I wasn’t going to set any personal records in the next day’s forecasted heat but was looking forward to the seat time and above all getting to know the Apex Pro. Full disclosure: as the SoCal Retail Manager for Winding Road Racing, I saw this as an excellent opportunity not only to gain more knowledge about the product for our customers but also for my own personal improvement. Admittedly, I’m a total data newb. Sure, I’ve done my research and have been through training on data, but I need to engage in recording and analyzing data for myself before I feel comfortable going into depth about data with other people. While the AiM products we carry are great and I have experience with them, I was very intrigued by the Apex Pro after hearing Andrew Rains, Marketing Director for the company, talk about the unit at length on the SlipAngle Podcast. I was also impressed by its simplicity, iOS app functionality, and price-point. The Apex Pro is focused on providing feedback while you’re in the car at speed on the track. Fast forward to freshly arriving at Buttonwillow on Sunday morning at 6:35 AM, when the temperature was only a mild 75 degrees Fahrenheit. Later in the day it would reach 105 outside and brutally higher temps in peoples’ cars. After preparing my car to run, as well as attending the intermediate drivers’ meeting, I didn’t have a whole lot of time to get situated in the car. This is where the Apex Pro’s first major benefit became apparent: ease of setup. The day prior I ensured that my unit worked, that it synced with my iPhone7 flawlessly, and that all the lights blinked as they should per the company’s website. I was good to go. Back at Buttonwillow around 8:45 AM with the mercury somewhere around 80 degrees, I was getting ready to head to grid. Thankfully the Apex Pro hadn’t been damaged in transit thanks to its tough metal construction and hard-shell zip case. If you’re like me, you get a little nervous and want a minimal number of tasks impeding your preparation as possible, so the simplicity of the Apex Pro is great. I have a regimen when getting in the car: yanking on my 3-point seatbelt with CG Lock to tighten it, moving the seat slightly forward, turning on the GoPro, turning off traction control, putting my helmet on, putting my gloves on, and slowly rolling over to grid. This routine was not cluttered by preparing the Apex Pro. Once I arrived in the back of grid I turned on the unit, opened the app to connect it, ensured the unit was calibrated to my car, tapped “Drive,”-and then the app moved over to the drive screen, ready to start recording. Folks started rolling out, LS V8s, F20Cs, 13B Reneses, and BP 1.8s-a-roaring. I tapped “Start” on the app, and the unit sprang to life with blinking bright-green and red LEDs. I revved up my little 1.5 liter Mazda MZR to begin tracking on Buttonwillow in the counter-clockwise configuration. The session began under a yellow flag to get everyone’s tires and brakes warmed up, ensure we knew the track’s conditions, etc. My primary task at hand: observing how the Apex Pro changes colors and moves across the 12 bright LED bulbs. It is instantaneous and was very easy to comprehend in the lower periphery of my sight. Once we came upon the waving green flag on the front straight, I pointed an eager Camaro behind me by and upped my speed ever so gradually. Braking into Sunset (Turn 1) and turning right was far less scary counter-clockwise that it is clockwise. As I moved from the brake to the gas, Apex Pro informed me via a couple of leftover red bulbs that I hadn’t gone as quickly through the turn as I could’ve. Well, you can thank spinning out and almost smacking the wall there last Summer going clockwise, my little electronic friend. I made a mental note as I continued on towards the Esses. In a Mazda2 you have plenty of time to make such notes. When I reached Sweeper, I tried to mimic a similar line to what it looks like clockwise: stay wide and cut in very close while slowly pushing down more and more on the gas once you get through a quarter of the turn. Success! The Apex Pro approved of my line, speed, and gave me full green LEDs as I exited the turn. I was now approaching Phil Hill, which I had heard is more intimidating going counter-clockwise. I stayed mostly-inside with moderate speed and sure enough, the Apex Pro approved. I think throughout the rest of the day I had the exit (or rather, landing) of Phil Hill down pretty well, but was struggling to find the right entry. I tried different lines and speeds, and even made a massive error in the process; I didn’t put my foot down on landing a few laps into the first session and spun anti-climactically off-track to the left. I’m still cleaning California’s Central Valley out of my car’s interior. As for the rest of the track during my first session, I enjoyed the real-time feedback as I got set up, braked, began the turn, hit the apex, and exited the turn. Trying to hold as much speed as the tires can take, and really turn in to get the Apex Pro to give me as much green as possible, resulting in a healthy feeling of accomplishment and some wow-did-I-just-do-that facial expressions under the dark tint visor of my helmet. After running sessions and utilizing the Apex Pro’s real-time feedback to try different lines, brake later, etc., now it was time to get down to brass tacks and dig into completed session data for analysis. This portion of using the unit, like setup and recording, is very simple. When you tap to end the session your final lap is considered the in lap, and you can now review each lap in great detail. In addition to reviewing data tied to a track map, there are graphs you can compare variables, as well as a scatter plot. These variables consist of Apex Percentage, Speed, Ax (Longitudinal Acceleration, positive forward), Ay (Lateral Acceleration, positive rightward), Gz (Yaw Rate), Time, Distance, Heading, X (Distance East from Starting Line), and Y (Distance West from Starting Line). My primary focus was on analyzing my Apex Percentage around the track and determine where I could work on a better line. I also paid close attention to Ax, which is essentially braking force, since I’m in a light momentum car and can really take advantage of braking harder and later. 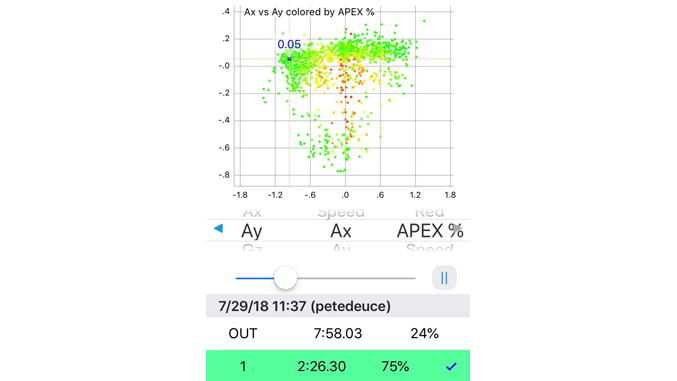 Sure enough, the data did not lie: in sections where I braked hard, such as slowing down into Grapevine, Apex Pro gave me full green; where I was easier on the brakes, such as entering Bus Stop, it showed me that I left more speed on the table. Putting all of this into practice demands a lot: determining the best plan of attack to blend Apex Score and Ax, having enough courage to brake later and turn in with more speed, trail braking with more care, feeling the brakes and tires to know if you can indeed turn up the heat, and executing all of this with other cars on track. The most brilliant accompaniment of analyzing all of this data is being able to replay your lap and see what the lights were telling you as you look at all of these various overlays. You understand why it is telling you that you left speed on the table, why you consistently sailed through that one corner with ease, why you might try braking earlier or later, or when to get back on the gas. Diving deeper into Apex Score, a higher Apex Score doesn’t necessarily mean a lower lap time, but it does mean that once the other aspects of driving are experimented with and refined, one can expect improved results. My highest Apex Score was my final clean lap of the day during my final session. My lap times from my first session around 9 AM were almost 3 seconds faster, however, the scores were lower. My first session’s highest score was 71% with a 2:26.31. The following lap was 70% with a 2:23.89. My final session’s highest score was 75% with a 2:26.30. Based on my review of these three laps, one could conclude the following: with better temperatures (it got much hotter throughout the day), harder braking in spots, less braking in others, better apexes, lower traffic (or, not having to lift for point-bys), and a little more courage in certain spots, I could potentially set a much better lap time! Setting goals is what track work is all about, whether it be trying to set a lower lap time, gaining more seat time, figuring out certain corners, and experimenting with different tires or suspension settings. Adding the aim of bettering one’s Apex Score to this mix is a solid way to effectively combine a lot of these goals. 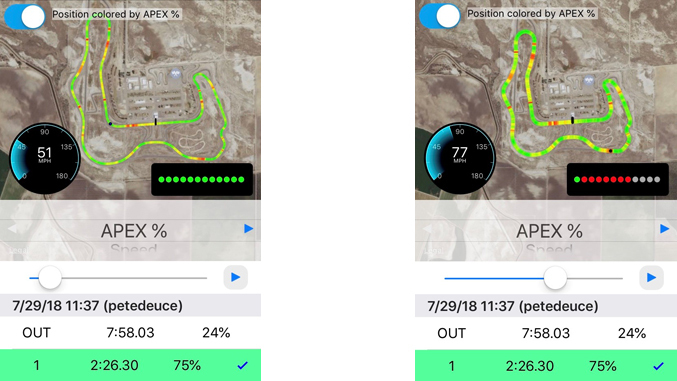 With measurable data at one’s fingertips, the Apex Pro enables enthusiasts and racers to determine where they need work, track their progress, compare techniques to see which is most successful, compare data with friends, and overall just have fun with the analysis aspect that many enthusiasts dread. I’m very much of the opinion that there is no substitute for seat time. Whether through instruction or just getting out there and working on one’s sessions, money is best spent on this crucial aspect of this sport we all love so dearly. Lighter wheels, stickier tires, bigger brakes, power adders, aero – these are certainly worthy investments, but for the sake of truly being able to take advantage of them, making the most of one’s seat time and investing more in it will develop a driver’s solid foundation.